When APQC started analyzing this data, it was expected that there would be a relationship between what an organization spends on KM and the overall success of the program. For instance, a well-funded program would have better solutions in place and more resources available to communicate with, train, and motivate potential users—and thus, higher employee participation rates. It was also hypothesized that KM programs with big budgets would be seen as more effective by leadership. After all, if executives did not believe strongly in the KM program, they would not be willing to fund it so generously. So what does have a clear, widespread effect on end-user adoption and leadership perception? 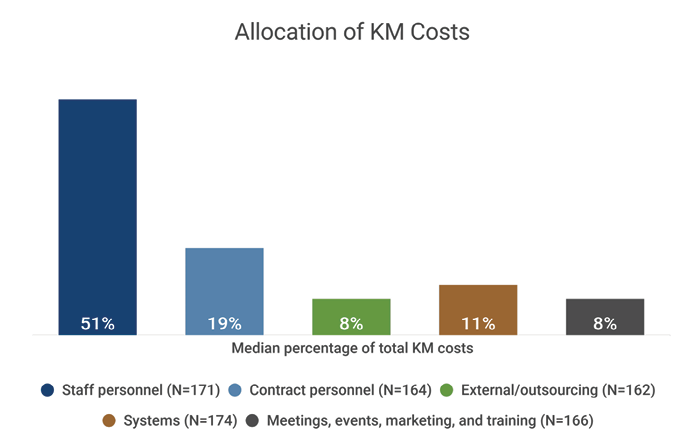 Whether an organization’s KM budget is lavish or lean, results improve when spending is backed by a formal business case for knowledge management. KM programs with business cases in place are 30% more likely to have more than 60% of the target audience participating in at least one KM approach. These programs are also 64% more likely to report that leaders believe the KM program to be effective in achieving its intended purpose and 52% more likely to expect approval of their next KM budget to be easy or very easy (Figure 3). The connection between KM business cases and budget approvals seems logical. If the KM program has a formal business case that lays out what resources will be needed when, then the budget the KM leader submits for annual approval should contain few surprises. Leaders know what to expect and have already agreed to the business case, so it (theoretically) should be easier for the KM program to acquire resources during the annual budgeting cycle. It also makes sense that a business case boosts the likelihood that leaders will see the KM program as effective in achieving its intended goals. A well-formulated business case outlines what the KM program will achieve, the measures used to track progress, and the projected timeframe for results. This helps set realistic expectations and prevent misunderstandings about what KM will (and will not) do for the organization. The KM program still has to deliver on its promises, but at least the KM core team and the leaders sponsoring and funding the program start off with a shared vision for the program and what “effectiveness” means. ♦ What contributions those people need to make. ♦ The types of benefits they can expect immediately and over time. If potential participants receive and absorb this information (either directly from the business case or through other messaging), they are more likely to get involved. This, in turn, boosts KM participation rates within the target audience. If you haven’t formalized a KM business case or feel that your current one is lacking, start with a business goal in mind. Why is your organization implementing KM, and how can KM be applied to strategically important problems or opportunities? Once you establish the rationale and scope of the KM effort, you can lay out specific objectives, key performance indicators, requirements, estimated costs and benefits, and a timeline for implementation. This will help you communicate with leaders about everything you need to execute your vision and strategy. It will also guide budget allocations and enable you to make the most of whatever resources are made available.